In-depth with the latest from Apple. 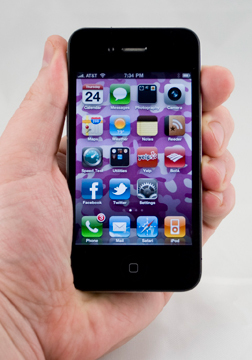 The iPhone 4 brings some long-awaited features to the iPhone table, without trying to do everything the competition can do. The interface, the screen and the camera have all been dramatically improved, but will these be enough to keep Apple at the top of the super-phone pile? With Apple, it's always the little things that count. Verizon Wireless today said that users of iOS 6 devices will be able to use the FaceTime feature over Verizon's cellular network without paying extra for it. The feature will be available to the iPhone 5 and other Apple devices as a part of their monthly data allotment. Google today provided a minor update to the Google+ application for iOS devices. Google+ version 1.0.9.4278 adds the ability to set instant photo uploads, see who has +1'd your posts, and adds access to the What's Hot stream. T-Mobile USA CTO Neville Ray today said that company was able to develop its current LTE migration strategy thank in part to the collapse of its acquisition by larger rival AT&T. "We're getting new AWS spectrum as a result of the termination of the AT&T deal (pending regulatory approval), which we will use for LTE," said Ray. A small company called Vocre is offering an application that lets users conduct a FaceTime-like video chat that includes live language translation between the two participants. Users can join a video chat session and communicate even though they don't speak the same language. iPhone owners can now download content from the App Store over 3G cellular data networks that are up to 50MB in size, which is an increase from the previous 20MB limitation. The size increase applies to applications and music. Verizon rumors for iPhone? Anyone? Please share! I read on facebok.com/iphone4 today that VZW will launch iPhone 4 in January. Is this true? ZAGG protective coating to help with reception? If the wdges are covered by a plastic coating wouldn't that keep the two antennas from shorting each other? Has anyone installed ZAGG's invisibleSHIELD on their iPhone 4 or know someone who has? Your opinion!!!! 😲 😲 😲 Really? You mean there isn't a #1 device out there? Lol! Good review Phil and Rich, I liked it! I feel it all comes down to opinion. You really have to look at the user and decide what the device is used for. If you like to personalize your device, mulit-task (for real), run widgets, ect., then maybe Android is for you. (If you are and Apple fan-boy, then maybe you should stick with Apple, JK guys!) If you like the integration of iTunes, ease of use, and gaming, then maybe the iPhone is better for you. In different parts of the world Nokia's Symbian OS would crowned king in some eyes. Seems someone is not a big Apple fan. When it comes to voice, the signal performance rated no better or worse than the 3GS. That's not a compliment. In just a day of use each, we both experienced multiple dropped or failed calls. Color us unimpressed. this isn't exactly a sin 'ya know; steve is a mere mortal after all. OMG!!! Someone pointed out the flaws in the device yet still said it was a phone you should get. They must be evil. Anyone who points out facts must not be a fan! Wow... can't believe you were so down on the design. The feel of the glass and metal gives me the perception of a fine watch. I've suffered through many a creaking battery door, 'soft-touch' devices where the rubbery stuff rubs away with use, and just plain cheap feeling. The T-Mobile G1 probably wins in the poorest of build quality for a smartphone. The iPhone-4 though is the best -- I've never held a device that felt so rich. Elegance oozes from the look and feel of the device. I got one of the overpriced bumpers, which in their own right are quite well designed and built, but when it's on, I miss that metal band -- hate to cover it up, though the iPhone looks great with that as well. I have to agree that I cannot see how someone could not like the design of this phone. It is easily the most finely crafted cell phone, if not the most finely crafted piece of electronics period, on the market today. I agree that wether or not you like the design is definately a matter of personal taste. Personally, I think the phone looks nice. I don't know that I'd call it an "instant clasic" or anything like that, but it looks nice. I'm glad you like your Evo. I thought the writer did a fantastic job in reviewing this device. I thought he was very fair with his assessment, and came across as an unbiased user, which is what you want in a "reviewer". He praised all of the things the iphone does real well (music, video, ease of use, etc...) but highlighted where this phone was lacking. First off, I tend to agree with the author on the design of the phone. I've always been a huge fan of the iphones, and while I'm still getting the phone (waiting on the white) I'm not thrilled with the design when testing out my friends phone. I'll deal with it though. multi-tasking - I tried running/listening to my AOL Radio app, but as soon as I switched to another app (calendar, safari) my radio feed just ends. Umm? Although I definitely see where you're coming from about apps being able to integrate with the OS, in some ways, I'm really glad Apple doesn't let it happen. I remember carrying a Windows Mobile phone, which was pretty customizable for the most part, but a lot of times when those intergrations were made, it hurt the performance of the phone in a big way. I can see why Apple doesn't want Apps to come close to hurting performance. Apple doesn't want to be blamed for a program messing up their phone...because on the consumer side, it won't be, "Awe man, that App made my phone run slow" it will be, "My phone runs slow." To paraphrase an iPhone carrying friend of mine when discussing the lack of multi-tasking on the devices. "If I want to bog down my device by running social networking apps integrated with my OS that should be my decision, not Apple's." There's a whole lot of social networking integration that could be done with zero impact on performance. Just a one-time import of your Google and Facebook contacts when you set it up would be very nice. Most of the competition has that. how would you compare the browser speed of the iphone 4 with a nexus one running 2.2? In my side-by-side tests, the iPhone 4 was always faster than my N1. This could be due to faster networking performance on HSDPA or faster Wi-Fi with 802.11n, or something else entirely.